Want exciting early looks at upcoming games? Well, you've come to the right place. Introducing Wiiloveit's Previews section, an area of the site that's dedicated specifically for these kinds of articles. We're sure that when we have an opportunity to get an early look at a new title, you'll appreciate having this coverage! BATTLESHIP will be arriving in stores later this week, and as an adaptation of the storyline present in the upcoming film as well as the turn-based principles of the original board game, it can be said that the development team has multiple targets to reach out to. But what is BATTLESHIP trying to do, exactly? Serve as a faithful re-creation or a slightly different take on the familiar mechanics? Last week I had a chance to check out a demonstration of the game in action, and based on what I've seen, I'd say it's wedging itself between those two ideas. While the gameplay seems decent, I'm still interested in seeing where and how far the developers go with it as it runs its course. Each armed with their own set of units, battles will have naval allies face off against the aliens to take command of control points at sea. Out on the battlefield, each team will alternate turns, using any of the vessels in play to move into place for a defensive maneuver or go on the attack against a nearby foe. Each ship has its own range of units it can travel to, and whether you or an enemy is the one responsible for the triggering of an attack, quick cutscenes will take place fairly often to show the attack being executed. If you attack from behind, you can do more damage than you would if you were to direct your blows to the side or the front of a ship. Additionally, special moves can be performed for even greater damage, but at this point, I have little familiarity with the extent to which they can be applied. It could be that this is true across the board, but in the map that was chosen for the demonstration, there existed a landmark that allows you to deploy two different vehicles if you make your way over there, but you can only send out one per visit. Speaking of the Nintendo versions specifically, the developers did not deem it necessary to retain that core change attribute of having first-person segments. These have instead been sort of replaced by a shooting mini-game of sorts where you aim at oncoming missiles emerging from the main vessel at close-range and fire using the B Button. This vessel -- the Stinger Orca -- can be seen as the main threat that you have to take down, but because of the impact defeated enemies will have on its attack power, it makes sense to eliminate the minions first before taking down the leader. The game is arguably more family-friendly this way, but could the game potentially be seen as having refrained from taking any notable risks because of it? Perhaps. But now's not the time to be making any rash judgments. It is my understanding that the mechanics will develop as you go along, with elements such as invisible off-the-radar ships that must be considered in your strategy, but beyond that I have little to think in terms of how BATTLESHIP could grow as a game. How will other maps and even the other officers influence the game design? And besides the interest in seeing where the turn-based system could go, I'm also curious to find out how this will trickle down to the environment of a multiplayer experience. When all is said and done, does BATTLESHIP have the power to make waves? Well, I first wouldn't say there's a lot riding on this. After all, I'm sure some are already counting it out just as a licensed property. But with roots to draw from -- the film and the original board game -- perhaps BATTLESHIP will shape up to be a fun bout for those who have enjoyed what Hasbro has done outside of the game space. We'll have to wait and see if Activision's attempts here towards a full-fledged project will result in anything worthwhile. With development team Zen Studios at the helm, Zen Pinball 3D is a great fit for the eShop, much better than any package that could have been designed for the retail space. With Europe already getting an extended turn with the arcade tables, it's time for 3DS owners in North America to have a go at things. What can you look forward to come this Thursday when the game releases? 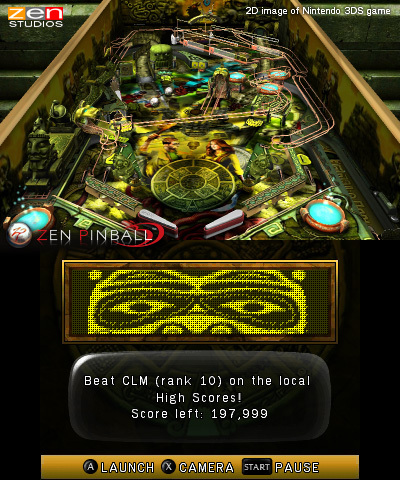 The downloadable title features four different pinball tables: Excalibur, Eldorado, Shaman, and Earth Defense. While all of them share the same basic features including metal rails, ball saver triggers, and flashing panels, each table carries a specific all-encompassing theme that affects the different gimmicks that are made available. For instance, the setup of the Eldorado stage evokes a feeling of curiousity, and with that, you have secret compartments that open up after meeting certain conditions, as well as trap doors that can lead to misfortune (like poison) or treasure (like in the case of the secret tomb). Part of the fun comes from discovering these secrets for yourself, but there is a Table Guide so you can get a breakdown of the different gimmicks present. Furthermore, these secrets aren't just limited to the Eldorado stage. Each table has its own sense of mystery to it and different goals you can set for yourself, but these are always presented with a different feel. Unique challenges are featured on each board with a huge payout bonus for completing them. When these occur, you'll see text appear on or scroll across the digital panel on the Touch Screen to signify that you've triggered something special. Moving your eyes to the bottom screen to view these messages can be tricky to manage while you also focus on the ball traveling on the upper screen. But in the case of some of these challenges, the ball will stop moving for a few seconds so you can get a chance to glance at the text. I'm also really liking the features they've incorporated here. Acknowledging that sessions can last more time than a person anticipates, the developers have allowed players to go back to in-progress games on their next visit. More noteworthy, though, is how they've made use of the 3DS' Friends List function. Whenever you beat a local high-score, a bubble will appear on the Touch Screen to congratulate you on the accomplishment and push you towards the next score goal. But beyond just the default records, the game also uses scores submitted by people on your Friends List to spur you on. And even outside the game on the Friends List itself, those you're connected to are able to learn where you are in the game, whether you're on the Main Menu or actually playing a table. It's pretty cool, and it sets a nice example for other developers to follow. Featuring exciting tables to play on with additional content promised by way of DLC, you should definitely consider picking up Zen Pinball 3D this Thursday. We'll have a full review of this game in the coming days ahead. 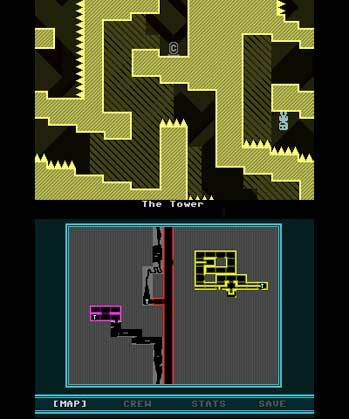 VVVVVV (alternate pronunciation: The Letter V Six Times) graced indie gamers on PC and Mac worldwide last September and introduced players to Captain Viridian on his quest to rescue his five other crewmates. Through retro visuals, a unique gameplay mechanic, and chiptunes, players were able to connect to Terry Cavanagh's nostalgic vision. Very soon, Nicalis is bringing out a 3D version of the game to the Nintendo eShop. After spending quite some time with it, here are my thoughts on the game. Unlike most 2D platformers where you simply run and jump, this game takes things a little differently. The first is that for the running, the physics are slightly looser. There is no momentum, as you can move at full speed and then stop on a dime with no problems. The second is with jumping; there is none. Instead, you press any button to reverse Viridian's gravity, sending him towards the top of the screen or back to the bottom, with no changes made to the environment. As you can probably guess, this leads to some absolutely insane and tough puzzles. Items might take you by surprise at first, such as white bars that will reverse your gravity upon hitting them (without prompt from you), huge spikes that you have to carefully bounce around, and more. But within ten minutes you'll be moving around like a veteran -- until you see the next new obstacle. The game also has no level scrolling, per se. Upon moving against one of the edges of the screen, you will snap into a different "room" to explore. Each room has a title, listed at the bottom of the game screen, which are sometimes just generally helpful to follow the story (Command Room) or, more often than not, inside jokes or pop culture references. Reading them might get you killed, but they are definitely a key part of the game and you should make sure you read as many as you can. Speaking of dying, you will die... a lot. The game has checkpoints littered everywhere so that when you do die, you can respawn in what seems like a microsecond. The game also has Teleporters scattered around less frequently. These not only are capable of taking you to any other Teleporter you've been to previously, but they also function as save points. The amount of times you die can be viewed on the bottom screen of the 3DS version, to encourage you to replay the game with fewer deaths. 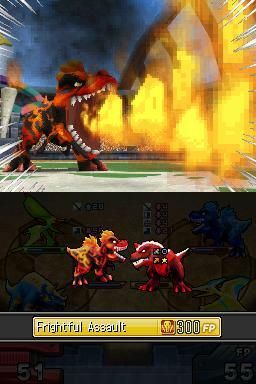 The game on the 3DS uses the 3D screen for 3D, but not the entire screen; the game displays in 4:3 a la DS games. This is a smart move and perfectly maintains the aspect ratio on the 3DS version, though some may complain. The 3D is not very strong, but instead is very subtle, used mostly for the backgrounds. This is fine considering the amount that you will be focusing on the death traps. The soundtrack is also fully present, however without headphones, some of the tracks come out slightly quietly. This might be fixed for the final release, however it is doubtful. For someone like me who has completed the PC version a multitude of times, the main game is exactly as you would remember it, so thus can be completed from memory. On the other hand, the user-created level feature that has been implemented into the 3DS version should be able to extend the game's longevity greatly. 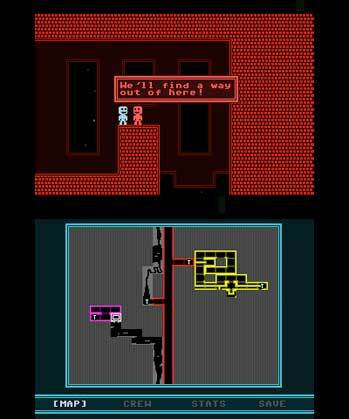 VVVVVV for the 3DS promises to be a great package. It's the original game with added bonuses such as portability, 3D, and user-created levels, so you would be a fool to pass this one up... even if you are a VVVVVVeteran. Look forward to our full review of this game after it releases! Unlike Super Mario 3D Land where I could try a few levels and have a good idea of what the game's foundations are, testing out Fortune Street for the first time took a longer period of time by comparison. To ensure I got the "full" experience, I made sure to put in about an hour's worth of playtime (give or take) into the preview build I got to test out this month. And if there's one thing I could take away from my recent experience with it, it's that Fortune Street offers a different experience compared to what I've already been exposed to with other games of this genre. In the build I tested out, there were five characters to choose from, with three of these taken from SQUARE ENIX franchises. Characters had no voices during gameplay, however speech bubbles with text would appear at the start of a person's turn or when an event took place. 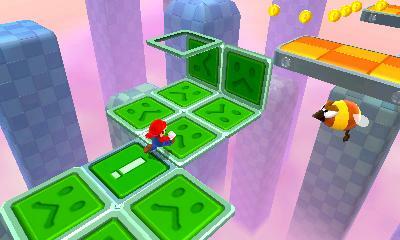 This version of the game featured a single map that you could play on with a Bowser-themed environment as a backdrop, complete with lava and a small army of Dry Bones characters appearing on occasion. At the outset, the game will inform you of the financial target you need to reach which serves to regulate gameplay across longer-than-30-minute sessions. To get started, all four participants are given a medium supply of spending money they can use as they explore the map. As far as actually moving around the board goes, the demo was mostly D-Pad based with no pointer use to be seen. 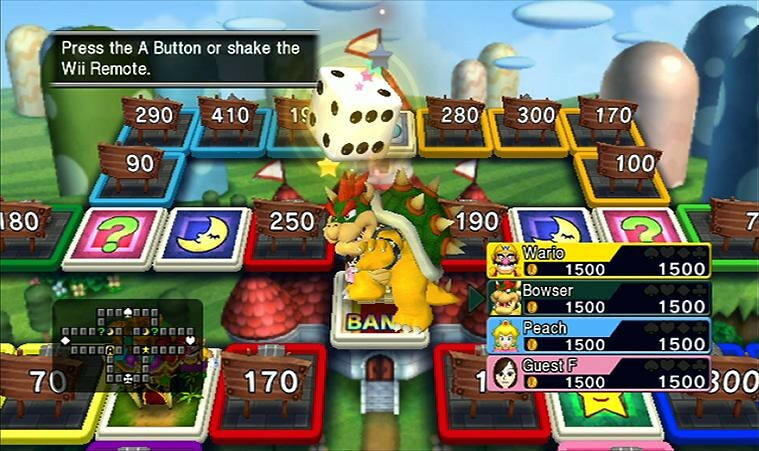 Dice rolls, however, were handled with a shake of the Wii Remote or a press of the A Button. All of the vacant property spaces on the board have signs indicating how much Gold is required to claim that space as your own. Each space varies not only in the property type (like, for instance, a grocery or a toy store), but also where it stands in the stock market. Certain spaces acquire profit margins that will enable you to accumulate wealth faster than others, so it's important to consider these important details prior to purchasing. Should you decide to go through with the purchase, the space will be clearly marked as yours with some branding plastered onto the small structure and your character's colour applied to the space itself. Property value or max capital will increase if you can successfully link a series of spaces together. But given the omnipresent mentions of Monopoly whenever this game is brought up, you might have guessed this already. As you do that, you can accumulate assets for yourself which can then be invested into the same properties you manage. From the player menu, you can opt to manage your shops by upgrading, selling or auctioning them off entirely. The auction process in particular is easy to follow, with price negotiations going back and forth amongst interested players. While your main goal is to reach the financial target, left to their own devices, players might grow weary of the main promise without having something else to keep the game moving away from a standstill pace. Although not clearly explained from the get-go, it became evident that all players had a secondary goal of gathering the four suit shapes at the corners of the map. Once collected, they then need to be deposited into the Bank space which, in this case, was located in the center of the board. You don't need to have an exact dice roll to add to your suit collection or make a deposit; simply passing over these spaces will do the trick. When deposits are made, you'll get promoted, which acts almost like a real-life salary increase. Principally, though, the biggest benefit this provides is significant increase in any profit gained from opponents who land on your properties. Keeping on the subject of moving things along, the board also featured a little hut where you could participate in very simple mini-games. 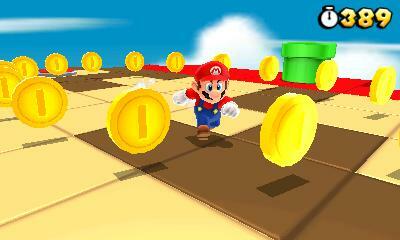 These include throwing a dart at a spinning wheel or a memory activity using items hidden inside coin blocks. These were single-player only, which got me thinking if team activities will be introduced later on in the game. Furthermore, it's certainly possible that the available mini-games varies depending on the map -- in fact, I'm hoping that that's the case. I also noticed some rows of cards appeared on-screen at a couple points during the game that led to temporary events like having all shops closed for a few turns. While I didn't get to see the full force of these being used, I definitely liked the thought process behind them. Obviously, the online component was absent from the preview build, but this is definitely something that especially excites me about this game. The ability to play online is something that has been requested at length once Mario Party hit the Wii, so depending on how well the implementation turns out, maybe that'll send a strong signal to Nintendo that they can make it work. Overall, I was very pleased with my first playtest of the game. My only complaint is that I found the target a little high since the level dragged on a bit towards the end. Still, I found it mildly amusing to play, especially as Slime from the Dragon Quest games seemed to be dominating for most of the game. 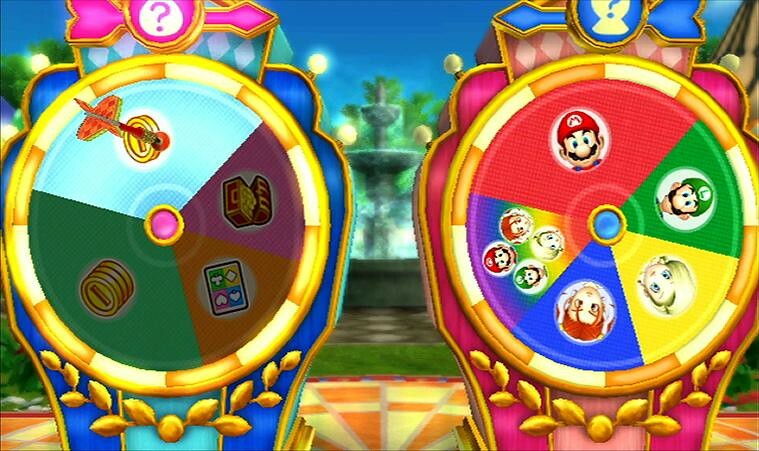 Having just said that, though, I don't think Fortune Street is a game that is meant to offer the same kind of amusement seen in the Mario Party titles. As a matter of fact, after having played the game myself, I now think that comparisons to Mario Party are a little unfounded. 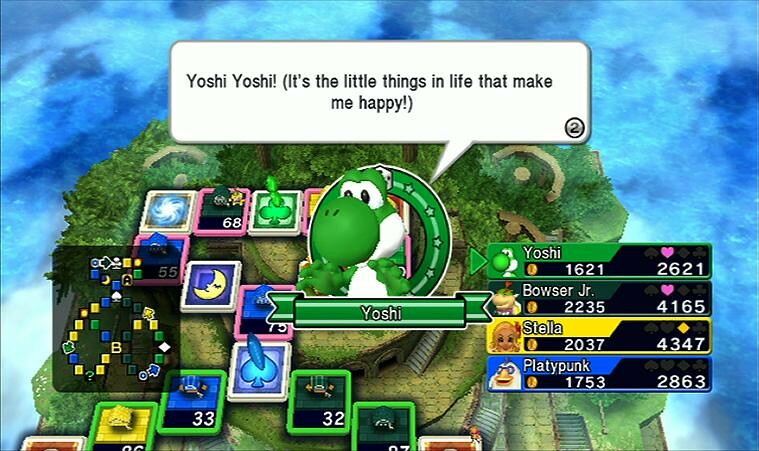 Not just because of the minimized use of mini-games, but Fortune Street has a slightly more serious and focused tone to it. Thankfully, from what I can see, this does not serve as a deterrent to the fun factor. The full version of Fortune Street surely has much to offer that I still have yet to see. But based on my experience with the game so far, I am definitely looking forward to reviewing this title upon release. With all the excitement surrounding The Legend of Zelda: Skyward Sword, I feel privileged to have had a chance to check out the game prior to launch. Widely regarded as one of the most ambitious Zelda games in existence for its sheer vastness, the preview build I got to test out certainly helped me realize some of the foundations of the entire adventure. 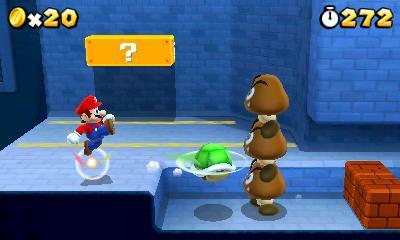 The demo had three different gameplay types to try out, between Bird Racing, Dungeon and a Boss Fight. Given my attraction to the exploration focus seen in Zelda games, I decided to give the Dungeon one a shot. Right away, I couldn't help but notice the semi-interactive HUD. Having all the functions listed off to the right during gameplay works very well, and because the game does feature button prompts, there's definitely validity in having it visible all the time. 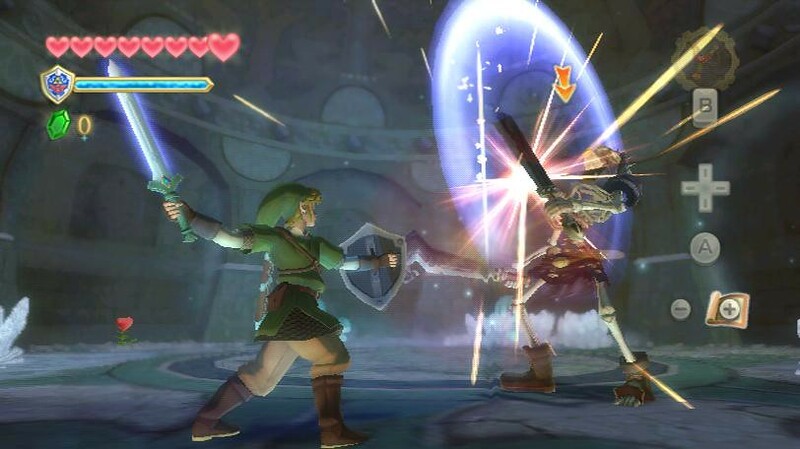 One of the most praised features about this game is the fact that Skyward Sword was designed to make use of WiiMotionPlus to create a fully immersive experience. With Link standing in a stationary position, you can begin by pulling out your sword with a quick sweeping motion. Obviously, the Analog Stick is used to control Link around the environment he finds himself in, and by holding down the A Button you can move around at a faster pace. Doing this will consume energy from a circular gauge that only pops up when actions to which it's tied to are used. A bit of forced strategy, if you will. Now, by holding the B Button, you can pull up a menu that features different items in Link's "backpack", including a bow and a beetle. The dungeon I found myself in had a gated round-shaped room in the middle that had to be unlocked by a diamond switch situated just atop the entrance. You had to pull out the beetle for this part, which required you to first aim a large targeting reticule with the Wii Remote's pointer and then launch the robotic device with the B Button. Piloting the beetle required defined movements, as I found controlling it was a bit sensitive. I especially found vertical movements to be kind of stiff. But all the same, I did like controlling the little guy. 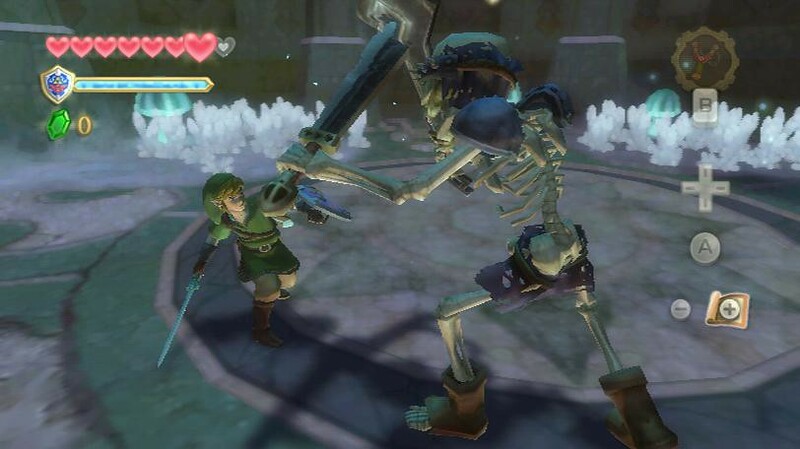 Upon entering the room, a skeleton enemy engaged me in a confrontation, and it's from this point that I got to see the sword-fighting mechanics at work. 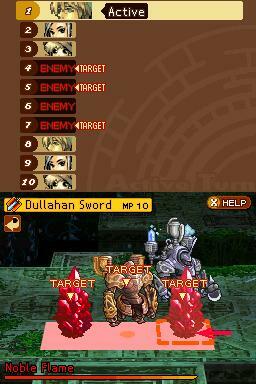 As with most battles, players need to observe the weak points of the enemy and attack the vulnerable areas. The WiiMotionPlus-equipped controller affords greater control as you swing at the enemy. The system doesn't feel limited at all, allowing players to perform side thrusts and frontal jabs depending on how you wield the controller and how you execute your swings. By quickly shifting both controllers to the left, you can also perform a spinning move with your sword -- another action that is subject to the energy gauge I just spoke about. In holding the Z Button, you can lock onto enemies of any sort and effectively encircle them as you look for a weak point. All in all, the sword-fighting mechanics were pretty sharp from what I could tell, but I am wondering how this will play out over longer battles. Following the brief encounter, a treasure chest was dropped by the enemy. Opening it to that classic discovery jingle Zelda fans know and love, there was a beetle upgrade found inside. To escape the locked room and head back outside, you basically had to follow the same strategy of using the beetle to re-activate the switch you used earlier by sending it through a skylight. Just outside the room, there were other enemies that tried to catch you off guard if you entered their personal space, including giant spiders and one enemy that I originally thought was an NPC I could talk to. But before I knew it, the 10-minute (or so) demo was over -- too soon, I might add -- and gameplay faded away to a "Thanks for Playing" screen. In actuality, the demo felt like it was only five minutes because of how engrossing the game started to become. Hopefully that's a sign of what the full release will be like. Although I didn't get to try all three segments of the demo, I actually liked the direction Skyward Sword was taking me. It feels like a Zelda game that's of a greater sophistication than what I've observed in past games. I was told that there is a darker atmosphere to the game that takes hold later on, but that aside, there's something innocuous about what's presented here. Hopefully Patrick will shed some light on Skyward Sword as a whole as he approaches the full review in the coming days ahead. Before trying out the latest entry at a press event last week, I had no previous experience with Fossil Fighters. However, I've always thought it might serve as a decent enough variation on Nintendo's own Pokémon franchise, if only because it has a more educational element to it. Now with the sequel making Fossil Fighters an actual series instead of just a one-off release, eyes are on Fossil Fighers: Champions to see if Nintendo has successfully adjusted whatever flaws were present in the original and to determine if this series is worth continuing even on non-DS platforms. The preview build actually has you starting out in a hut located in what seems to be the main hub world, if not just a place to crash in between expeditions. In this central area, there were different other huts that you could visit, including one where a keeper would provide useful tips or provide a bit of background. There's also a shop where you could purchase new fossil rocks to add to your collection. I presume players can use this as an alternative to actually going out and finding the rocks on their own at the respective sites. I spent most of my time exploring the Jungle Labyrinth -- a place I'd hesitate to refer to as a "dungeon". 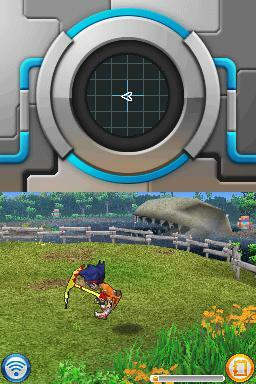 As you explore areas like this, all of the action takes place on the Touch Screen with the screen above being used to display a radar, with dots representing places where you can dig for fossils. This excavation site had multiple areas you could visit, albeit the area itself seemed somewhat small in size. Passages leading off to other sections of the Labyrinth often weren't very clear with all the greenery. I also observed quite a few NPC's lurking around as though this was a tourist attraction. In searching for different pathways and elements to interact with, I stumbled across a machine known as the "VMM". After dismissing thoughts of the memorable Dreamcast memory cards, I did some research and discovered this is what's known as a Vivosaur Management Machine. Through this I discovered that players can set up to three different Vivosaur teams prior to battle engagement to prepare for rival teams. From here, the game also walked me through an interactive tutorial on how battles operate. The actual system seemed kind of interesting, with the battle menu allowing you to change team formations and choose different character-specific attacks. 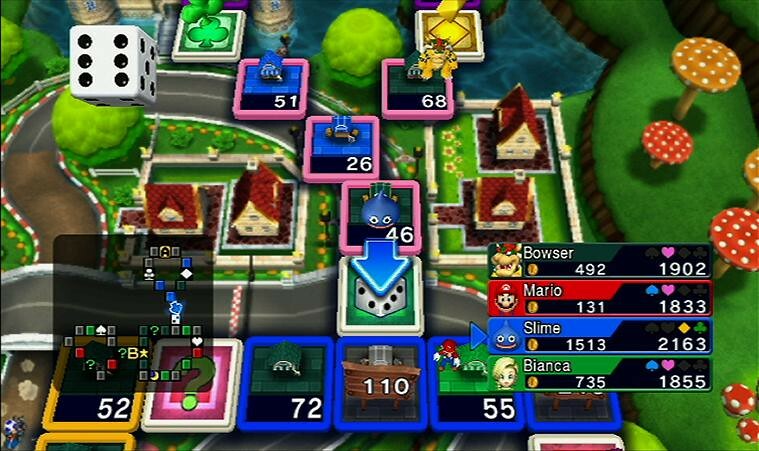 The game also establishes a point system that determines who attacks first, and it seems that this also comes into play in other respects over the course of battles. That was about the most experience I had with the battle element of this game (and that's only because I had to search it out). The build I tried didn't really lead you into fossil-finding or even maintenance of discovered fossils. I think it's safe to assume players were probably expected to search these out too. There's a possibility that this maybe came later on in the build, but then again, why not lead players into it right off the bat? Nevertheless, the full version of this game will include downloadable content, co-operative fossil-cleaning parties, as well as Wi-Fi battles -- a first for the series. Once again, Fossil Fighters: Champions seems decent enough, but I'd have to spend more time with it to give it a fair judgment. From what I could observe, though, there is a line of depth to this kid-tailored approach to monster-raising. And this is what may propel players further into the game once they've seen everything there is to see with the basic mechanics. Patrick will have a review of the game sometime after the game launches, so be on the lookout for that if this new Fossil Fighters does interest you. Am I the only who thought this game snuck up on them? When I received word that Super Mario 3D Land was launching this Sunday, I was a bit surprised. I guess it didn't register when I first heard the release date as it likely seemed far off. In any event, last week I had the opportunity to preview upcoming first-party holiday hits courtesy of Nintendo of Canada and Cohn & Wolfe. Super Mario 3D Land was one of the games on display there. In keeping with the weekend launch of the game, read on for some early thoughts on the game. The preview build had four different levels available, and out of the four I tried out three of them. Each of them presented a different environment with the latter two showcasing different approaches to the core platforming foundations seen in the initial grassland I encountered. For example, I found the structure of the second level lended itself to a slightly more exploration-oriented feel whereas the first stage felt more linear. This is despite the fact that it was of a faster pace due to the presence of time-sensitive tile puzzles (made famous in Super Mario Galaxy). Aside from the standard collectible coins, there are also large coins you can gather as well -- yet another nod to recent mainstream Mario titles. There wasn't a direct indication of what purpose they served, but I think it's safe to assume they'll lead to unlocks on the hub world. One other cool feature I can recall was the presence of these special warp boxes. In one level, I was taken to a room where I had to gather as much coins as possible from a single coin block which, admittedly, wasn't all that special. But it did get me thinking about how these boxes may bring players face-to-face with intermittent puzzles on the side. The controls didn't click with me right away, but after a brief spat and with a little trial and error, the layout wasn't as tricky. In addition to your standard jump ability which has been mapped to the A Button, Mario can also perform a rolling somersault or a hip drop move. I especially thought it was interesting that the R Button is used to travel inside pipes. Was that really the best choice, I wonder? The Touch Screen serves a functional purpose that resembles New Super Mario Bros. on the DS, in that spare power-ups are stored in a circular container and can appear on-screen once you tap the item with your stylus. Also, you can press small arrows to change the orientation of the camera. I'm wondering if the manual camera control might be used to encourage players to look at previously-visited areas from a new vantage point. If so, some may view that as somewhat superficial; the fact that obscured areas may not be seen unless this feature is utilized. But I can't comment too much on that for the time being. Continuing on the subject of power-ups, trying out the Fire Flower was kind of fun, albeit the fireball-tossing running motions didn't seem to work quite the way I envisioned them. It took a bit of getting used to, which is something I quite honestly didn't expect to have to do. Now as for the Tanooki Suit, I'm personally not as ecstatic as others are over its inclusion, but I did enjoy having the ability to hover in mid-air. Performing that gliding motion as you soar over a block of platforms with the camera looking down at whatever's beneath you looks well done -- especially with 3D on. In general, the 3D effects in this preview build do add dimension to the playing field, but it seems like Nintendo isn't just content with having a checkmark for including it. In one instance, there was an opening behind a wall where a large coin was hiding. With 3D enabled, the opening was made more visible and the emphasis on the background while you're behind the obscured area makes it so that you don't lose touch with all that's happening. Of course, spotting the opening in the first place is partly dependent on the angle of the camera at that moment, which once again has me thinking about how this camera system will be perceived in later levels. In venturing to the three different stages, I entertained the thought of the entire world taking place inside a box where 3D-enabled function allows you to peer in deeper. It's quite surreal actually, and it pushes certain limits previously associated with handheld gaming. Furthermore, there's something very balanced about the action presented here, at least from the levels I tried. With the exception of the less relaxed battleship level I saw, it seems to me that there's more of a focus on platforming than there is in overcoming obstacles that may slow you down. Super Mario 3D Land bears similarities to classic Mario games as well as New Super Mario Bros., yet I was beginning to think this game might actually serve a similar purpose that Galaxy did for the Wii. Needless to say, it certainly whet my appetite for things to come. Provided the level designs will push players more and the 3D will continue to serve an exemplary function, I do have faith -- more than I did before -- that Super Mario 3D Land has the makings of a memorable platformer. Stay tuned for Patrick's full review of the game to come post-launch and keep an eye out for more articles on the aforementioned press event. Let's cut to the chase here. If you've played Mario Kart DS, you should already know what to expect here. This title is a similar affair, and sticks with the eight-racer format of the previous handheld title. That said, there were a number of improvements and changes from the demo I tried that are well worth mentioning. The first thing I noticed was the menu option to choose not only which kart you wanted to ride in, but prior to that, the option to choose what type of kart. Namely, the weight. Rather than automatically having heavy racers like Bowser be forced to choose heavier karts, whilst relegating smaller characters like Toad to sit in the more lightweight vehicles, I had the option of choosing any kart weight I wanted on any of the characters. I tested all different types, and didn't notice any major difference in gameplay, but I assume this will be adjusted and individual kart specs will be made clearer upon final release, when you'll have the option of creating and customising your own very own karts. The second thing worth mentioning is the new landscape types. We've all seen the underwater and gliding segments of the game from E3, and sure enough they do add a completely new dynamic to the game. Whether they're a worthy addition that make the title feel more like an upgrade upon previous versions is questionable, but they're a nice touch. In the air, you can dip down to meet the ground faster, or stay afloat in the hope of catching some extra coins floating across the sky. The purpose of said coins, which are scattered around each race, was unknown, and upon asking one of the Nintendo reps, they said "they're just in there because it's a demo". Of course, that makes little sense (if any) but I would suspect that after collecting 10 coins, some sort of a positive effect on karts or power ups will be implemented (I was unable to collect more than 10 at any one time). 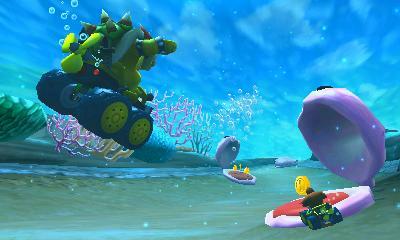 In the water segments, the gameplay is more or less the same, aside from the different environment and new obstacles such as snapping clams that come with the terrain. Of course, there are some new power-ups too, with the Fire Flower working as one would expect (shooting a bouncy fire ball straight ahead), but sadly I wasn't lucky enough to land myself a "Super Leaf". Perhaps that's because Super Leaf's are only available to losing players. I wouldn't know. I found the game surprisingly easy, and came in first place on several occasions, only failing to make the cut once. I'm hoping the game was on Easy mode, and adds more of a challenge than what was presented in Mario Kart DS, which I'm able to get 1st Place in every time against the CPU. On the subject of previous Mario Kart's, I'd like to note that the general slide/speed boost combo is more in line with the Wii release. 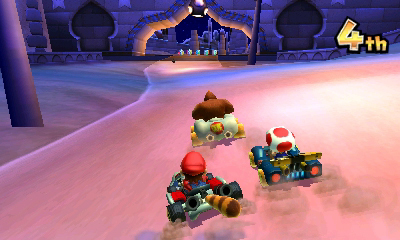 The DS version favoured a technique known online as "snaking", which could effectively give gamers an indefinite number of minor speed boosts throughout each track. This time around, minor speed boosts come from more natural drifting, and are far harder to replicate down straight areas of the track. I should also note that in previous games, the level of speed boost was determinable by the colour sparks underneath the player's kart, but in this release, only one minor speed boost was achievable, which should help to balance things out in the long run. Still, all the minor niggles I had here could well be fixed by the time the game is released in stores in two months time, and I'm hopeful that the game retains its enjoyable charm without getting too easy. And when all the little touches Nintendo has made come together, I doubt the franchise will wear out any time soon. This week, Big John Games treated me to some exclusive direct footage of their upcoming DSiWare title, Big Bass Arcade. There aren't that many fishing games on the DS, so much like Fantasy Slots, the developer hopes this new endeavour can capitalize on this not-so-crowded market. From what I could see, it looks like the game is shaping up quite nicely. First off, controls for the rod and reel can either be set to Touch Screen or Control Pad controls. However, I only got a glimpse of the former, so I have no idea how the other control scheme works. When it comes to the Touch Screen, you have a circular icon in the center that acts as your reel. To begin your cast, you drag the icon downwards and release it when the power meter has reached a desired level. Once your line has hit the water, you can spin the handle on the icon in a clockwise direction to bring it towards you. You can also jolt the line in a given direction by quickly swiping your stylus along the icon. As one would expect, there are different kinds of lures designated for different depths. The Frog lure, for instance, rests just on the surface of a body of water. You can unlock additional lures for use as you progress through the game and meet certain conditions. When a fish hooks onto your line, a horizontal bar will appear on the top screen to indicate line tension as you try to reel him in. In the process, you'll also receive directions telling you to move the rod in a certain direction to avoid losing your catch. If you are successful, the game will indicate the size of the fish before adding that number to your accumulated weight. The game looks pretty good graphically speaking, but I do have a slight concern over the action segments. I almost feel like they could pick up the pace a bit to add more challenge and realism. But to be fair, I haven't seen footage of the more aggressive fish or even the other difficulty settings, so there's a possibility things ramp up there. 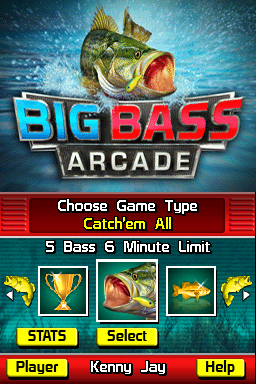 Speaking of which, it seems as though Big Bass Arcade will contain some decent variety in its mode selection. Between tournament cups, free play settings and specific challenges, there's quite a bit to choose from. I've been told that the final release will include over 40 events in total, set across 7 different locations. Anyone who enjoys fishing sims now and again will want to keep an eye on this one. Big John Games may have already submitted the game for approval by the time you read this, so hopefully you won't have to wait long to try it out. In the meantime, check out the newly-released screenshots of the game! Five days ago, I received an invitation to attend a live web demonstration of Atlus' upcoming RPG, Radiant Historia. The invite-only event took place this past Thursday, Feb. 3rd, hosted by PR Manager Aram Jabbari. For a title that has already shown so much promise through gameplay clips and screenshots, I went in with fairly high hopes that I would come away feeling excited. Here are just some of the highlights of the hour-long session I'd like to share with our readers. For the first few minutes of the demo, I got to see some parts of the intro story sequence. Starting from the very beginning of the game, players are first introduced to two guardians named Lippti and Teo. Both of them express deep concern over what Historia has become, and yet still remain hopeful that "true history will write itself" this time around. To be sure, there's a lot of mystery surrounding these two individuals and the kingdom at large. But before you can really reflect deeply on all that's going on, the story's main protagonist comes onto the scene. Stocke, a Special Intelligence agent, gets called in to receive his latest mission: meet up with a spy at a designated rendezvous point. Before embarking on his journey, he is given a strange artifact known as the White Chronicle. Exactly what this special book does is part of the discovery process players will undergo in this game. But you don't have to wait long to get an idea of the mysterious power this item holds. Just as you meet your new teammates, Marco & Raynie, a white glow engulfs the screen. When the fade passes, a rather disturbing scene is set before you: these two new allies have been killed! This leads Stock (and ultimately the player) to ask such questions as, "Is everything set in stone?" and "Could this foreknowledge be detrimental in the long run?" Although some of the dialogue was skipped in the demo, I could still appreciate the fact that the introduction won't be long and winded. And yet, they've successfully instilled a sense of mystery right from the start of the adventure, which is great. Another key point to emphasize was the fact that the game wastes little time in getting to the core gameplay principle. That's something that definitely struck me as well. Without getting into too many details, Radiant Historia's story takes a very interesting turn about 15-20 minutes in, where this time travel aspect is realized in a greater sense. And then there's all the cool effects that come with it, which includes (but is not limited to) the ability to make decisions that may produce negative consequences. The battle system was shown off quite a bit as well. Once again, I came away feeling rather impressed with this element. 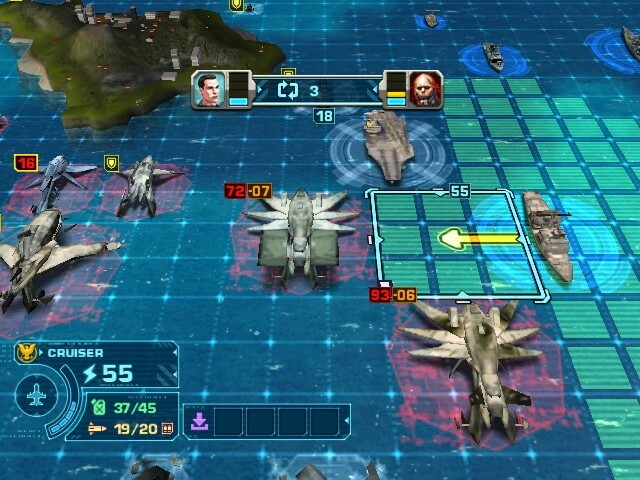 When engaging in an attack, the top screen will display the turn order, while the action-packed gameplay takes place on the touch screen. All enemies are positioned in different places on a 3x3 grid, but by using special skills, you can actually affect their placement on the battle field. This gives you the opportunity to pull off combo attacks by doing what's referred to as "stacking" enemies. When two or more enemies are located (more or less) on the same spot on the grid, your attacks can damage multiple foes simultaneously. Needless to say, this adds a whole new level of strategy previously unseen in other turn-based RPG's. Plus, the team confirmed that additional obstacles will appear on the grid at certain points in the game to further capitalize on this tactical approach to gameplay. There are six main selections on the battle menu: Attack, Skill, Change, Item, Guard, and Escape. Most of these are pretty self-explanatory, but one feature that does deserve more of a spotlight is the Change option. At any point during a fight you can adjust your position in the turn order list, which is actually quite innovative. Using this tactic comes at a price, though. As you wait for your next turn, that character is more susceptible to attacks than usual. But that's something you'll have to consider beforehand. Either way, I think it's a pretty cool ability. 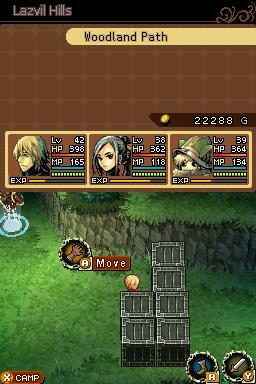 Anyone who's interested in this title will be thrilled to hear that Radiant Historia will last you a long time. At one point during the demonstration, Aram switched over to a save file that was already well along in the game. And as he accessed the Timeline spread, I noticed lots and lots of time branches which immediately took me by surprise. I'm not kidding - there are more than 200 different entry points (there's your "Wow factor" right there!) each representing a key event that occurred in the storyline. Really then, there's no need to worry about replay value, especially if you love to explore a lot. Over the course of the demonstration, I was exposed to some really emotion-filled songs as well. They conveyed sentiments very well, even without a large degree of musical depth. What added to this powerful effect, too, were the realistic sound effects. In one particular instance, there was a distressing scene where heavy rainfall was descending to the ground as soothing music played in the background. All the while, the characters fought to express themselves without letting their emotions get the better of them. I was pleased with both the songs I heard in-game, and the sample treats from the Bonus CD (which, by the way, will be packaged with pre-order/launch copies of the game). The music thoroughly grabbed my attention as one of the most striking parts of the game, and I eagerly look forward to hearing how the audio develops as time goes on (no pun intended). I can't think of any good reason why anyone would not want to put Radiant Historia on their list of games to keep an eye on. I wasn't disappointed in the slightest by what I saw. In fact, quite the opposite. Now I'm even more pumped for this release; furthermore, there's ample reason why you should be too. I've gathered that the game is built on a really solid foundation, and core features to the game that I've been exposed to are really strong in what they bring to the experience. I honestly feel they have real gem on their hands. And considering the handheld's lifespan is coming to a close, something tells me Radiant Historia will be remembered as one of the last great games to release for the DS.